Welcome to #18 - 41 Glenbrook Crescent in scenic Cochrane, Alberta. What a super location! Within walking distance to the bike path along Big Hill Creek, an elementary school, tennis courts, playgrounds, shopping, banking, the public pool, movie theatre & restaurants. 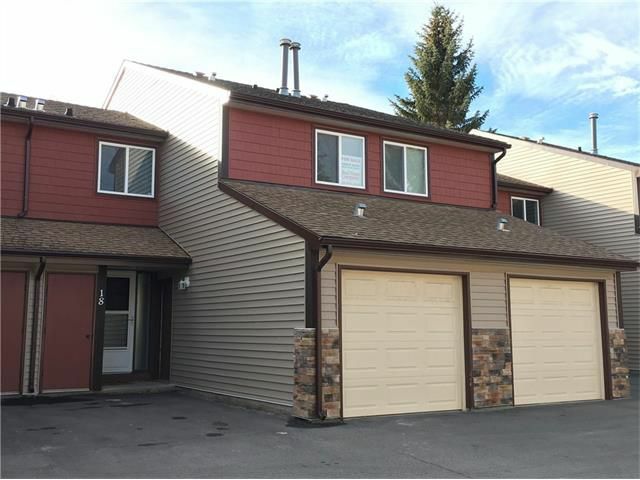 This 2 bedroom + loft townhouse features vaulted ceilings, a wood burning fireplace, great layout and a single attached garage! Upper floor laundry is really handy, and the loft is perfect for an office, library, music room, computer rm, etc. - use your imagination! The main floor is nice and open, and the huge vaulted ceilings really give you a sense of spaciousness. There is a large unspoiled basement area that could easily be transformed into a rec rm / storage area or hobby / games rm. Many improvements have been made to this complex in recent years, including new windows, roof and garage doors, and new siding and stone accents. Condo fees include water, sewer, garbage pickup & cable! Extremely clean and ready to move into!